I rented my current apartment hastily. The location is right, the size is right, the landlord offered me a spot in the garage for my motorcycle. Thank you craigslist, I’ll take it. Across the street was an eyesore of a building, a three-story deserted, boarded up mess. I barely paid attention to the view above that building, but over the months I have come to love the mountain and especially the cross, which I feel protects this household from evil spirits and unwanted pregnancy. They tore down that building across the street, and started rebuilding it. A few weeks ago I realized, in one of those moments where your heart just sinks, that in its place will be a four-story building, and out my window I will see nothing more exciting than the occasional bedroom view, when one of my neighbors forgets to lower the blinds. Since then, as the new building comes up, my days under the spell of the cross have taken on increasing meaning. 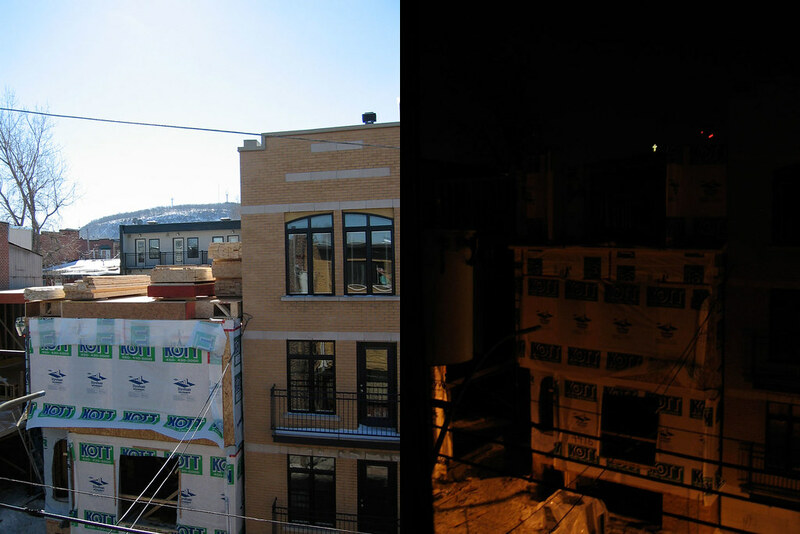 Yesterday they built the ceiling on the third floor, and out my window this evening the fourth floor is almost finished. They built the two sides of the floor, and, in a thoughtful gesture, have left the middle unbuilt, as if to say, this is your last evening, enjoy. This is one of so many examples of the importance of stimulus vs. context. I would have moved into this apartment if there were no view; for example if there were a four-story building across the street from me before, and they tore it down and replaced it with another four-story building, I would have enjoyed my view during the construction but would not be bothered by the loss of the view when the fourth story was rebuilt. In this case, I have come to understand my apartment as one with a view of the mountain and the cross, and I earnestly feel wronged by its obliteration. Hurt, even. When you recognize that most of how you respond to something is contingent not on the thing itself but on your expectations of that thing, you can conduct yourself in such a way that you’re more likely to be pleasantly surprised and will enjoy many more good moods-I call this managing expectations. I go about this by minimizing exposure to preconceptual bias as much as possible. For example, once I decide I’m going to see a movie I will actively avoid talking about it, reading its reviews, I even try to steer clear of the trailer. When I’m being set up on a blind date, I don’t want to know what you think of her, just give me her number and I’ll arrange it. Expectations are the enemy of a good time.